Bangkok’s public transport system is ever evolving, and there is a myriad of ways to get around the Thai capital. In fact, it may deservedly be a city that’s famed internationally for its gridlocked roads and for blessing its residents with the world’s longest commutes, but often there’s an alternative to sitting in a traffic jam. Getting under the skin of the various ways to get around can be a real challenge, though – especially when it comes to the likes of buses. Whether you’re based in Thailand long-term or are passing through on a trip, this is your cheat sheet to help you use all the various forms of public transport to navigate Bangkok like a local. Bangkok’s multicoloured taxis – cheap, seemingly everywhere, and generally comfortable – are the obvious choice, especially for those fresh off a plane who have yet to get their bearings. That said, the state of the car and the driving style of the person behind the wheel can vary dramatically. Taxis are metered, starting at 35 baht and with the fare rising incrementally based on distance – some taxis, which have passed checks put in place by authorities as part of a phased fare increase, are authorised to charge slightly higher (but still metered) rates. Taxis are easily found 24 hours a day outside hotels, shopping centres and tourist attractions, and it’s easy to hail one down on the street, too – but be on the lookout for rogue drivers who refuse to turn on their meters. Our best advice in that situation is to simply refuse the driver or, if you’re already inside, to get out and hail another cab. A number of call centre and smartphone app services also operate in Thailand, allowing you to book either a public taxi or a private vehicle at similar rates. Tuk tuks are the quintessential Thai form of transport that every visitor to Bangkok wants to try once. In truth, except for that novelty trip they’re not widely used by locals – except perhaps for old grannies and street food vendors lugging huge unwieldy loads of fruit and vegetables back from the local market. That’s not to say it’s not worth jumping in a tuk tuk – it’s an experience you should try while you’re here! – but it’s one that’s best done either for a short hop or on a route where you know the fair price to pay. They’re available pretty much around the clock, though you may have a harder task finding one late at night. Tuk tuks aren’t metered, so be sure to agree on a fare before you climb aboard, and expect to haggle hard. Be wary, too, of unrealistically cheap fares – you might get an inexpensive or free tour of the city, but you’re also likely to spend at least part of the day touring a (fake) gem warehouse and being pressured into making a purchase. Better still, avoid all of this by getting your tuk tuk experience and enjoying a stress-free tour of Bangkok’s best nighttime sights on our Bangkok Night Lights tuk tuk tour! Motorbike taxis, with their drivers found clustered at the end of streets in their easily recognisable bright orange vests, are among Bangkokians’ favourite ways to get around the city. They’re cheap, fast and available around the clock (though in far fewer numbers late at night), and can easily beat the traffic – but that doesn’t mean they’re safe, and you should wear a helmet whenever you can (easier said than done, as most drivers don’t carry a spare one for their passengers). You ride pillion behind the driver, either straddled across the seat or with your legs to one side (a more ladylike but frankly petrifying position that many Thai women adopt), and fares are regulated and are displayed on boards by the cluster of drivers, where you can also queue for a ride at peak times. But if it’s not a route you know, or if you hail down a driver along the road, it can be worth double-checking the price before you set off. Also be sure to check whether your travel and/or health insurance policy covers you riding a motorbike. Perhaps the most convenient way of getting around Bangkok in air-conditioned comfort – though less so at peak time, when you’re likely to be crushed inside an overcrowded carriage with a view of someone else’s armpit – the BTS is an elevated train that cruises above the city’s congested roads. The two lines, known as the Sukhumvit and Silom lines, run between Mo Chit and Bearing stations and National Stadium and Bang Wa stations respectively, and connect at the Siam interchange station. They cover many of Bangkok’s downtown attractions but are a long way from offering comprehensive connections elsewhere in the city, for tourists most notably to the old town of Rattanakosin island and Banglamphu. There are also connections with the MRT Subway, the Airport Rail Link, the BRT special bus route, and the Chaophraya Express river boat. Buy a ticket for the Skytrain at one of the self-service machines at the station entrance – some newer and larger machines now accept small denominations of banknotes, but most still only take coins; you can get change (but not buy single-journey tickets) at the counters next to the ticket barriers. Journey costs run from 15 up to 52 baht depending on the number of stations you are travelling through. You can also purchase one-day unlimited-use tickets for 130 baht, or purchase or top up a stored-value Rabbit card; these offer discounts if you purchase a fixed number of journeys in advance, or provide convenience (by allowing you to skip the ticket machines) but no discounts if you simply top up a cash amount. The BTS runs from 5.15am onwards (the timing of the first train depends on the station, and ticket/change counters don’t open until 6am so before then you’ll need to have change for the coin-operated machines); the service winds down around midnight, with last trains departing just beforehand or just afterwards depending on the station. Much like the BTS, the air-conditioned MRT is a welcome addition to Bangkok’s transport scene, but isn’t yet anywhere near comprehensive in terms of connectivity. The single-line subway runs from Bang Sue in the north to Hualamphong in the south; both offer connections to the mainline railway, with Hualamphong being Bangkok’s main railway terminal. The MRT also has a number of interchanges with the BTS. Ticketing is much the same as for the BTS, except that you can choose whether to purchase your ticket from a machine or from the counters next to the gates (the downside to this is that it makes the queues much longer at the counters); fares run between 15 and 40 baht. Like the BTS, a stored-value card offers convenience if topped up with a cash amount (since no discounts are provided) or savings if recharged on a monthly basis, when it provides unlimited travel for the period purchased. The MRT runs from 6am to midnight, but note that stations begin to close from 11.30pm onwards. The BRT is a bus rapid transit system that so far offers one of five planned routes, running between Sathorn (close to Chong Nonsi BTS station) and Ratchaphruek. The buses that operate the route have their own lanes, allowing them to travel faster than other buses while not being obstructed by traffic. Fares range from 12 to 20 baht depending on the distance travelled; purchase a ticket from a machine before boarding. The BRT runs between 6am and midnight. A number of Chaophraya Express boats ply the river that snakes its way through Bangkok. They’re distinguished by the colour of the flags flown from the back of the boat, and among them are the local orange-flagged boat that stops at most piers between Nonthaburi and Wat Rajsingkorn temple and costs a flat-rate 13 baht per journey; the blue-flagged tourist boat that travels more quickly, stops at fewer piers (between Sathorn and Phra Athit only) and provides English-language commentary on major attractions, costing 40 baht for a single trip or 150 baht for unlimited all-day travel; and the ultra-local flagless commuter boat that runs only at peak times but serves all piers between Nonthaburi and Wat Rajsingkorn (with fares between 8 and 12 baht that vary depending on the distance travelled). All boats serve the central Sathorn pier, connected to Saphan Taksin station on the Skytrain’s Silom line; other piers useful for visitors include Phra Athit for the Rattanakosin island and Banglamphu areas (including backpacker enclave Khao San Road), Tha Chang for the Grand Palace, Tha Tien for Wat Pho, Ratchawong for the Chinatown area of Yaowarat, and Yodpiman for the Pak Khlong Talat flower market. With the exception of rush-hour-only boats, most operate between around 6am and sunset. Convenient cross-river ferries also connect sights on opposite banks of the water, and usually only cost a few baht. The humble bus is perhaps the most challenging forms of public transport for visitors to Bangkok to use, such is the sheer number of different routes and types of bus available. That’s not helped by the fact that they’re a slow way to get around, most buses have their destinations written only in Thai, and that most bus stops are in a poor state of repair and often have outdated information posted on them. But buses are cheap – some are free, while many run as low as seven baht and few cost more than 20 baht – and they cover almost the entire city, making them worth getting to know if you have the time. Flag down a bus as it arrives (it likely won’t stop otherwise! ), clamber onboard and take a seat – the conductor will come around to collect your fare, unless it happens to be a route offering free travel as part of a long-running government initiative (identifiable by a blue banner with white text running right along the bottom of the windscreen as seen from the outside). Fares on paid fan-cooled services are often fixed, but many air-con routes charge by the distance travelled, meaning you’ll need to tell the conductor where you are going. Many routes start at about 5am and begin to wind down after around 11pm; some run 24/7, though fares often increase (by no more than a baht or two) around 10pm. 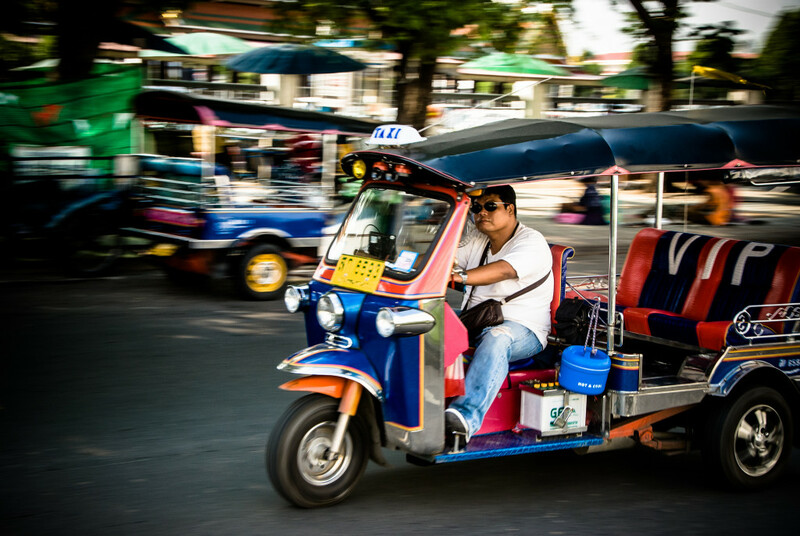 What’s your favourite way to get around Bangkok? Do you favour speed and comfort, or do you like to travel in the most local and cost-effective way you can? What’s your experience with these modes of Bangkok public transport? Let us know in the comments!